S. Sharma et al., “Nanofilaments on glioblastoma exosomes revealed by peak force microscopy,” J Royal Soc Interface, doi:10.1098/rsif.2013.1150, 2014. 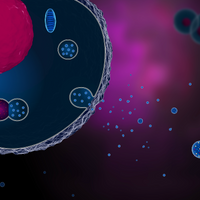 Exosomes are ball-shaped, secreted vesicles involved in intercellular chatter, including the delivery of metastatic messages. 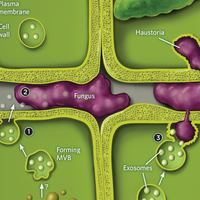 (See “Exosome Explosion,” The Scientist, July 2011.) Given exosomes’ tiny size—roughly 100 nm in diameter—electron microscopy has limited how much scientists can resolve of their structure, says Shivani Sharma of the University of California, Los Angeles. So she and her colleagues turned to peak force microscopy, a variant of atomic force microscopy, which can “feel” the shape of objects at the nanoscale. 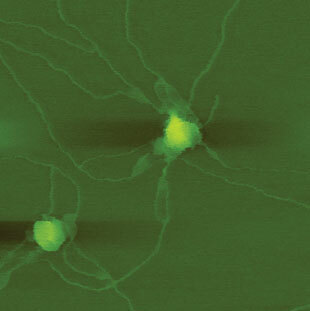 The team observed filaments, about 10–20 nm wide and up to several microns in length, protruding from glioblastoma-derived exosomes, but not from exosomes of normal human astrocytes. “This adds a totally new dimension to the exosome structure,” says Mattias Belting, an oncologist at Lund University in Sweden who was not part of the study. 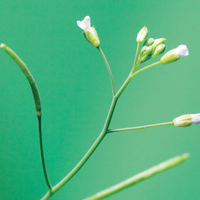 The function of these filaments is still unknown, but Sharma speculates that they might help transfer genetic material or anchor vesicles to target cells. 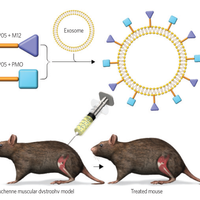 Her group found that cells take up glioblastoma-derived exosomes at a greater rate than exosomes from normal cells, although the role of nanofilaments in this process is not clear. “It’s an intriguing idea, and [it] will be interesting to see if it’s really happening,” says Emanuele Cocucci, a cell biologist at Harvard Medical School, who’s not convinced these nanofilaments exist just yet. He said the findings will have to be replicated, and he’d like to see how the exosomes look in a more physiologic setting, not dried overnight.